The City Nature Challenge uses iNaturalist (an app for sharing field observations)) and pits cities across the country in a race to see who can get the most participation and the most posts. This year Maine is competing as a “city”! GOMMEA will lead several outings to guide people in using iNaturalist and in exploring our amazing marine environments. 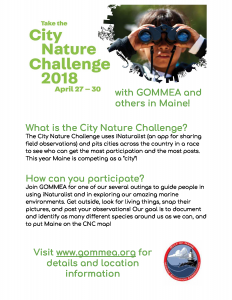 Join GOMMEA and the Maine Environmental Education Association (MEAA) at the Gulf of Maine Research Institute as we check out their unique C-RISE program. This sea level rise program brings local relevancy to global scientific data through local history, maps, and case studies. Join us for a 90 minute interactive experience to explore the impacts of sea level rise and weather events on community resources, and examine potential resiliency measures. The space for this program is limited, so please register online to reserve your spot. These events are made possible thanks to funding from the National Oceanic and Atmospheric Administration (NOAA). Celebrate World Oceans Day with us on June 8! Check out www.worldoceansday.org to find an event near you, or join the Seacoast Science Center in Rye, NH on June 10 for a FREE day of fun and educational activities and celebrate the important role the world ocean plays in our lives and grand opening of H2O Today, an exhibition organized by the Smithsonian Institution Traveling Exhibition Service. Join the global community in celebrating World Oceans Day on June 8! The action focus for World Oceans Day 2018 is to prevent plastic pollution and encourage solutions for a healthy ocean. Visit the World Oceans Day website to plan your ocean celebration with free resources including new materials for youth. Register your event to share your celebration with the world on the event map! Mark your calendar for our 2018 conference, Charting a Course for Conservation, which will be hosted by the Southwest Marine Educators Association chapter from July 15-20 in sunny Long Beach, CA! September is the time for International Coastal Cleanup Day. Every year this global endeavor brings as many hands as possible together to help battle an immense issue…marine debris. Communities everywhere will come together to help pick up and document the trash that litters their coastal habitats. This problem is one that will only be solved by each of us making small decisions every day to change the way we live and the impact we have on our ocean and our planet. 9/14-9/15 - Join the Blue Ocean Society for multiple cleanups along the New Hampshire coast. Friday (14th) is student cleanup day, and Saturday (15th) is public cleanup day. Click here for more information. 9/15 - Join the Bioblitz at the Seacoast Science Center in Rye NH. Check their website for more details. 9/22 - Join the kNOw SUP (a Single Use Plastic awareness group) for a cleanup on Pemaquid beach in Pemaquid, ME. Contact Lili Pugh for more details:. 9/24 - Join the Gulf of Maine Research Institute at Crescent Beach State Park in Cape Elizabeth, ME for a cleanup. Contact Adam Baukus for details. 5-8pmBigelow Laboratory 60 Bigelow Dr. East Boothbay, ME. 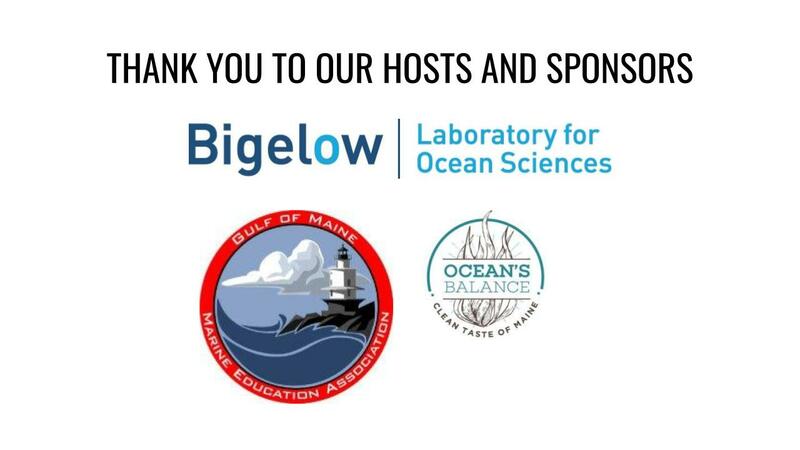 Join the Gulf of Maine Marine Education Association (GOMMEA) for a fabulous evening event on Oct 24! This year's annual meeting, to be held at Bigelow Laboratory in East Boothbay, will focus on seaweed in our coastal waters. Expect to learn all about seaweed aquaculture as you chat with Tollef Olson of Ocean's Balance and sample a variety of you-could-make-this-at-home seaweed recipes. Browse the poster session showcasing current research and the exhibits with resources to introduce seaweed to your students. 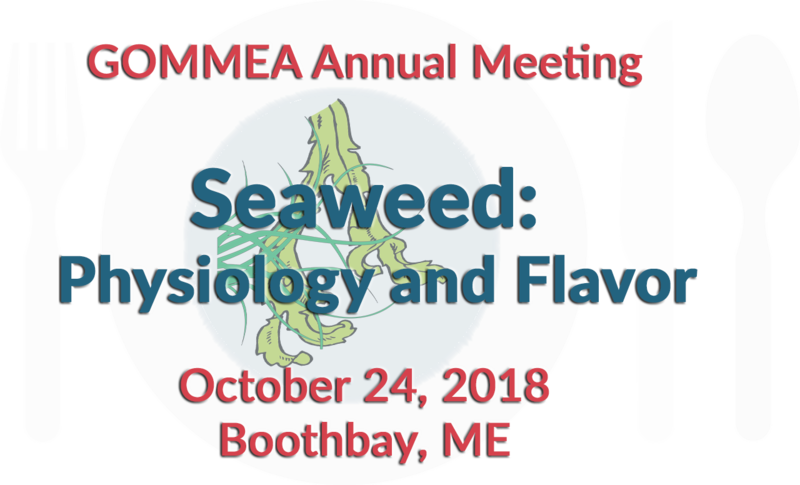 Enjoy a presentation from Dr. Nichole Price on her investigation of the important roles of seaweed as members of the Gulf of Maine ecosystem. Mark your calendar for Seaweed: Physiology and Flavor! On November 15th we will be joining our other regional chapters for an evening mixer event in Boston MA. 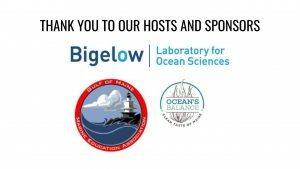 A crew will be gathered for the NEOSEC Ocean Literacy Summit and this evening event will be a chance to network with friends from southern New England and Massachusetts chapters. No better time to come learn what joining a local chapter is all about!